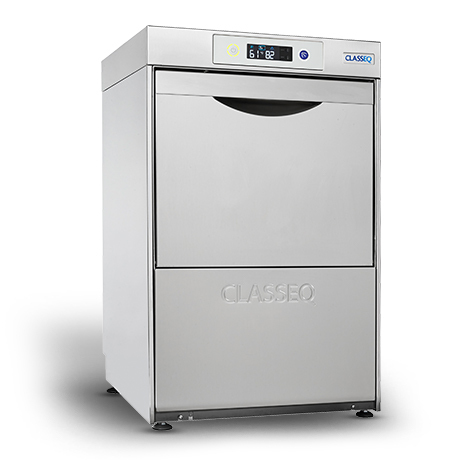 Front loading commercial dishwasher with three minute wash cycle and simple two button controls for effortless, consistently clean results. The D500 is an easy to operate dishwasher with a 500 x 500mm basket that holds 18 full-sized plates. It features three wash cycles of Light (2-minute), Standard (3-minutes) and Intensive (5-minutes), this machine is capable of cleaning up to 750 plates per hour. The D500 comes as standard with a gravity drain, which is suitable in instances where the machine is above the waste outlet. The optional drain pump (D500P) is essential where the drainage is either higher than the machines waste outlet, or has to be pumped to a stand pipe. Features three wash programs - Light (2 minutes), Standard (3 minutes) and Intensive (5 minutes) - the D500 is capable of washing up to 30 Racks / 540 plates per hour. All Standard Dishwashers can also be upgraded to include a drain pump - Essential for when the drainage is either higher than the machines waste outlet, or has to be pumped to a stand pipe. To upgrade to a drain pump, quote codes: D350P, D400P & D500P.